With this being the last Wingin' It of 2014, allow my family and I to wish you and yours a very Happy Chanukah, Merry Christmas, Happy Boxing Day and Happy Kwanzaa. I know it is politically correct to say Happy Holidays to cover all these special days and if you prefer this, then...HAPPY HOLIDAYS! GWRRA has always been a non-religious, non-political organization and that helps all of us focus on our main priority..."Friends for FUN, Safety and Knowledge!" As I read through all the newsletters I get, so many of our Chapters are planning their holiday parties and end-of-the-year parties. Everyone at the Home Office wishes you a very Happy and Healthy Holiday season and New Year! There is a another day in December that we should all remember ... December 7th, Pearl Harbor Day. Let us all remember those who sacrificed that fateful day. The last month of the year allows us to look back and evaluate what we want to change, or maintain, for the upcoming year. Some of us make predictions and some of us make new resolutions, right? And some of us decide nothing and just take life as it comes and just keep rolling along! Whatever your style, if you are like me...you are grateful! I generally make a few resolutions or set some goals, but as I get older the goal list gets shorter :) As with most years, this year has had its ups and downs, but mostly ups and for that, I am very grateful. Mostly, I am thankful for my family and friends and with most of my friends being GWRRA Members, I am very grateful to Paul and Shirley for starting GWRRA back in 1977!! I am grateful for all the folks at the Home Office who I get to work with, as they are the most dedicated people I have the privilege of working with daily. And obviously, everyone at GWRRA is very thankful for you and all our Members, Officers and Volunteers. Without you, this Association would not be the greatest motorcycle organization in the world. GWRRA is 37 years old and that is unheard of in this industry. We should all be very proud of what we have created and maintained! With Paul Hildebrand's vision and leadership over these many years, and all the help and assistance of the thousands of Officers and Volunteers, GWRRA has made an incredible impact on the motorcycling industry. It would be safe to say, that the best impact is the thousands of lives GWRRA has saved through its Rider Education Program. Thank you to all our Rider Educators from now to our earliest days when the program formally started with Pete Woodruff. They truly do live up to our motto, "Friends for FUN, Safety and Knowledge!" In other news, please remember to register for GWRRA's upcoming events, namely the Forty to Phoenix ride in April, 2015, then the Reno Rendevous, June 18-20, 2015 at the Grand Sierra Resort in Reno, NV and Wing Ding 37 in 2015 over the Labor Day weekend in Huntsville, AL. Please check our website at GWRRA.ORG for all the details. I want to take this opportunity to thank all of this year's contributors to the Wingin' It. It is hard to believe that the first e-newsletter was May 2009. You can read all the older versions at http://gwrra.org/enewsletters.html. Without all the Members and Officers who have sent in their articles, stories, travelogues, etc., the Wingin' It would not have been around this long. 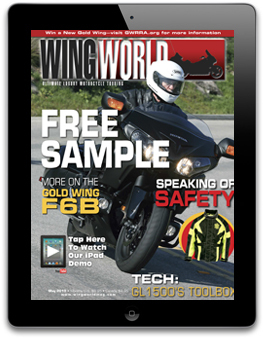 Thanks for this month's articles from Ray & Sandi Garris - and a very special offer from GWRRA and Joe & Gracie Mazza for their Rider Education article about winterizing your motorcycle. We thank Gene Hanselman for his wonderful stories and Tom Hendricks for his terrific jokes and humor. 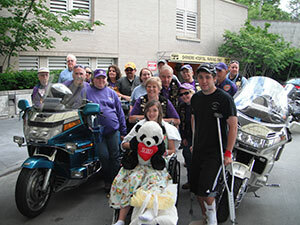 Bill and Dea Ann Gray send us a great article about "Assuming The Position." 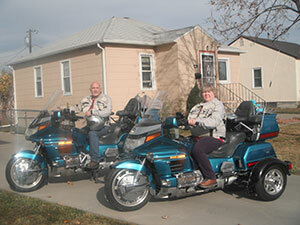 There is a story from Chuck & Betty Bonnett, our Montana District and Chapter Directors, about their "Teddy Bear Run." 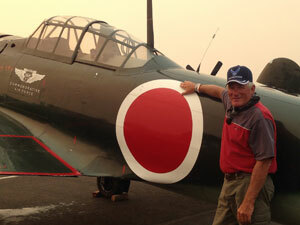 Then, we have the second part of the travel story from Keith Lindsay about his trip to the Reno Air Races. And, we have a Program Announcement from Tommy & Gayle Wilson, from the Member Enhancement Program about the Couple of the Year Program. And we have the Hall of Fame Profile of Dan Scott from Tulsa, OK. Don't forget to check out the coupon item this month at the bottom of the page. And finally, there is continued discussion to "Darksiders" feedback that appeared in Wingin' It a few months ago. Thanks for all your continued support! Ride safe and keep sending me your stories, Chapter activities, travelogues and Gold Book stories. (mechanical engineers) were standing at the base of a flagpole, looking up. 'Eighteen feet, six inches,' and walked away. Raymond shook his head and laughed. 'Ain't that just like a Miss know-it-all woman! Bob and Ray are still working for the government. This will be a new feature column honoring those Members who have recruited 101+ New Members into GWRRA. You will also be featured on GWRRA's Hall of Fame wall in the Home Office with your framed picture. When was the last time you took a ride over 500 miles? His name is Bubba, he is from Texas and he needed a loan. So, he walked into a bank in New York City and asked for the loan officer. and that he was not a depositor of the bank. The bank officer told him that the bank would need some form of security for the loan, so the Redneck handed over the keys to a new Ferrari. The car was parked on the street in front of the bank. The Redneck produced the title and everything checked out. Later, the bank's president and its officers all enjoyed a good laugh at the Redneck from the Texas for using a $250,000 Ferrari as collateral for a $5,000 loan. Keep an eye on those Texas boys! Just because we talk funny does not mean we are stupid !!! OUR GIFT TO YOU!! A $10 Gift Certificate! Can't find a parking space at the mall? Tired of fighting the crowds? We have just the right solution for your holiday shopping problems - how about a $50 gift certificate for GWRRA merchandise, apparel, renewals or new memberships? Here is the best part of this holiday plan - For every purchase of a $50 gift certificate you will receive an additional $10 gift certificate for you to use on "Santa." Here is your opportunity to give the gift of GWRRA for a new Member. They will thank you for many years to come because you thought enough to share the very best. Don't forget your favorite Chapter Director during the holiday season. Whether they use the certificate for some great new shirts or their membership renewal you will have really hit a home run! Sandi and I want to take this opportunity to wish each and every Member of our Association a very happy and safe holiday season. We hope that you all receive all of the very best blessings that your holiday celebration can deliver. So, don't forget to pick up the phone and call 1-800-843-9460 or (623)-581-2500 (in Phoenix) and ask for Santa. Order some $50 gift certificates for GWRRA and receive a $10 GWRRA gift certificate (for each one purchased) for YOU to spend. 1) Find a proper place to store your bike/trike, away from extreme temperatures (inside, if possible). 2) Purchase some gasoline stabilizer, enough inexpensive oil for an oil change, a new oil filter, cleaning supplies for washing and waxing the motorcycle and any tools needed for spark plug removal. 3) Take the motorcycle for one last ride, long enough to get the motorcycle nice and hot. This burns off condensation that has built up in the engine and also gets the oil nice and hot so that any bi-products are easier to remove when draining the oil. 4) Fill up the gas tank (full) while you are out and add the stabilizer. Make sure you have left yourself at least five minutes more of driving to let the stabilizer fuel work its way around the entire fuel system. 5) Change the oil and filter while the motorcycle is still warm from being run. Do an oil change according to your owner's manual. There is no need to use expensive oil for this step because you will probably get rid of it in the spring. After changing the oil, run the motorcycle in a well ventilated area for 1-2 minutes, then move it to its winter home. 1) Conserve your battery charge. Even some newer motorcycles experience some battery drain when the ignition is off. In order to maintain things like your clock and radio presets, you can remove the battery altogether and trickle charge it all winter. Or, if you prefer to keep things in one package, store the motorcycle with a fully charged battery and charge it once a month prior to spring time use. 2) Tend to your tires. If you can store your motorcycle with the tires off the ground, great. Taking the weight off your wheels is the ideal way to avoid flat spots or uneven wear, but if you don't have the right setup for that, your not out of luck. Fill your tires to the maximum recommended volume, place your ride on its center stand, and rotate the front tire a number of times during the winter to keep the flat spots away. 3) Fill up your fluids. Double check your motorcycle's brake, clutch, and coolant fluids, replacing or refilling if necessary. Remember to always use the type and amount of fluid recommended by your motorcycle's manufacturer. You can drain all the fluids entirely and then refill them when you are ready to ride again. If you live in a place where temperatures frequently reach sub-zero, check the antifreeze to prevent engine freezing. Lube the throttle, kickstand, shifter, and clutch cables to prevent moisture accumulation and rust. 4) Wax on, rust off. The metal on your motorcycle tends to accumulate moisture, which can cause rust if your motorcycle is left unattended for an extended period. Washing, drying, and waxing your ride before putting it away for the winter will prevent corrosion and other damage. Spray your exhaust pipes with WD-40 to keep moisture and rust away. For extra protection, stuff a clean towel or plastic bags into the intake and exhaust pipes to keep water and critters out. Cover your bike/trike. You should cover your motorcycle whether or not it's being stored indoors. Use a cover that can breath and not a plastic tarp. Moisture should not be able to become trapped under the cover on your motorcycles metal surfaces. If stored outdoors or in a barn-like structure, cover the exhausts to keep unwanted creatures from making a winter den. Well, there you have it. Hopefully, you can glean some ideas to help you get through the winter doldrums with your mind at ease knowing your ride has received the attention it deserves, since it brings you so much pleasure. Gracie and I would like to wish you all a happy, healthy, and safe holiday season. It seems every Chapter is faced with this scenario at some point; The Chapter Director decides to step down and the Assistant Director doesn't want the job. Does this sound familiar? The BIG QUESTION is "Who is responsible for the succession of leadership in a Chapter?" Is it the Assistant Director, Chapter Director or District Director? A. Assists the CD in his effort to bring about a well-coordinated, fun, active Chapter. B. Works with Staff Members. C. Assumes CDs duties in his absence. D. Becomes prepared to assume the Chapter Director position. The Chapter Director took an oath that includes "To provide a succession of leadership for my office!" Now you are thinking it is the Chapter Director's responsibility but wait a minute...To add one more caveat to the scenario, the District Director is the appointing Officer for the Chapter Director! Are you confused now? BOTTOM LINE: The Chapter Director is responsible for his/her succession! When appointing an assistant, the Director should always ask "are you willing to assume my duties in my absence and are you willing to take over when I step down?" Why does an Assistant Director change his/her mind? It is my opinion that too many times the Assistant is left out of the decision making for the Chapter, therefore is not prepared when the time comes. At the very least, Assistants should be copied on all e-mail communication from the Chapter Director and included in most decision making conversations. I highly recommend the Officer Certification Program (OCP) for all prospective Directors and Assistants. You will be amazed at how much you don't know or have forgotten about GWRRA. Assistants should be given an opportunity to prepare and run a Chapter gathering or two with the Director's guidance. Another scenario: There is no Assistant Director and "no one wants the job!" This is where you stay positive and think outside the box. Who are the current leaders in the Chapter? Who are the team players? Couple of the Year or past Couples? Membership Enhancement Coordinator? Rider Ed? Treasurer? These folks could be ready for a change and replacing them might be easier. Doesn't hurt to ask!! Our organization is built from the Chapter up! In order to survive, we must always have a succession of leadership at every level. If you currently are not a team member of a Chapter but would like to be, SPEAK UP! If you have aspirations of moving up, SPEAK UP! And our "TEDDY BEAR RUN" was born! I sit and wonder what it would be like unable to walk from the time of birth, or to not be able to do the things that a "normal" child can do like walk, run, or play. This was the thought process I went through when I visited The Shrine Children's Hospital in Spokane, Washington for the first time. We met a thirteen-year-old girl who was able to walk for the first time since birth due to the fine doctors at the Shrine Children's Hospital. To say that there were tears in our eyes is an understatement. Twenty years ago this children's charity was selected by our Montana Chapter B to support every year. The way we do this, is to hold a barbecue every spring selling hamburgers and hotdogs and with the proceeds we buy small items that the children use while they are at the Shrine Hospital for treatment and surgeries. The kinds of things we purchase and donate are: teddy bears and other stuffed animals, backpacks, craft supplies, paid phone cards and we even throw in a few gift cards to eat out somewhere (we all know how boring hospital food can be). Then in June we take a trailer full of these items, a vehicle to pull it, as many bikes and Members and anyone else we can round up to go with us, and head out on the 500 mile trek from Billings, MT to Spokane, WA to deliver the items and meet some of the patients. Nothing says thank you more than the smile of a child holding one of the teddy bears we took out, or one of the model motorcycles that we are able to take. 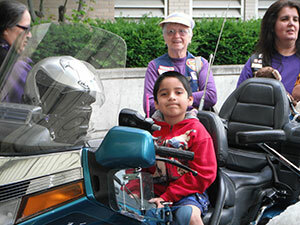 Have you ever seen the ear to ear grin of a small child sitting on your motorcycle? Priceless! Our wonderful local Honda dealership, Montana Honda and Marine, with James Winchell at its helm, has been an invaluable help with not only our Teddy Bear Run, but also with our membership drives. James has made sure that we have tables, chairs, and a Honda Gold Wing and makes room for us in their booth at The RV and Boat show held here in Billings, Montana every spring. This is a hard sell for new Members because we usually still have snow on the ground. James has also helped us by donating some of the model motorcycles that we take on the Teddy Bear Run, and letting us have a barbecue in front of the dealership. The staff at Montana Honda and Marine is also friendly and very helpful, from the salesmen to the service department and willing to do what it takes to help. In the last two years that we have been able to participate we have gained a very good rapport with our dealership and realize how important it is to have them on board with you. You don't really realize how much they are needed until you actually see their willingness to help and all the things that you didn't realize they are doing for you behind the scenes. Thank you James and a big thank you to all of your staff for your support throughout the years. If you are not familiar with your local Honda dealership, introduce yourself and see what happens. We are Glenn and Nanette Mizner, from GWRRA Virginia Chapter B, Virginia Beach and we are proud to be the GWRRA Region N Couple of the Year for 2014-2015. Both grew up in Warren, Ohio. Glenn joined the Navy in 1979 while Nanette was still in school. We met through a mutual friend in August 1981 and were married just 10 months later. We moved to Norfolk, Virginia immediately after our Niagara Falls honeymoon. We are fortunate enough to have lived in the Hampton roads area ever since. We have two grown children, Tiffany and Nathan, including a great son-in-law, Tiffany's husband Josh Panko, two dogs, and one grand-dog. Glenn retired after serving in the Navy for 22 years and currently works as a Technical Writer. Nanette has held various jobs over the years, but has settled at Plaza Middle School as a Teacher Assistant in the Special Education Department for the past 14 years. In 2005, we bought a 1985 Aspencade and rode around southeastern Virginia and North Carolina for several years, never going more than a hundred miles or so in a day. In June 2011 we purchased a pretty 2008 Cabernet Red GL1800. We immediately joined GWRRA and Virginia Chapter B and have not looked back. In just three and a half years, we have ridden well over 50,000 miles. We received our Level IV in September 2013 and we are strong supporters of the Levels Program. We have had a blast riding with our GWRRA friends, camping, and enjoying Chapter and District events across Region N.
We currently serve as Virginia District Membership Enhancement Coordinators and Chapter B MEC. We have served as Ride Coordinators and Glenn was Newsletter Editor for three years for Chapter B. Glenn is a University Trainer in Rider Education and Membership Enhancement and has developed two GWRRA Membership Seminars. Nanette is planning to attend the University Trainer Development Program class soon. It has been a great journey from Chapter Couple to Region Couple, and we look forward to meeting and making friends wherever we go. We look forward to representing Region N and having a blast over the next year. I planned to stay the day in Ely to visit the train museum. The museum has two operating steam engines and gives rides daily. Unfortunately for me, on this particular day they were operating a diesel locomotive. A steam engine would operate the next day but in the late afternoon. The museum tour and train ride lasted five hours. It was absolutely worth going to see. 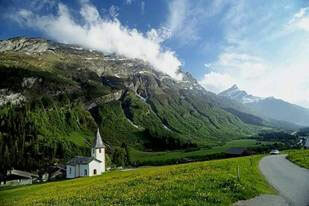 It is a 50+ acre site which you are free to roam. I'm glad I had the time to stay a day in Ely. Other sites around the city were also enjoyable. The KOA was very nice and had grass to camp on, very little road or train noise during the night. LIFE magazine once did a feature on Nevada and claimed that Hwy 50 (which connects Ely with Carson City) was the loneliest road in the U.S. Not to be outdone, AAA advised their clients not to drive the road. In response to this negative press, the state of Nevada came up with a clever tourist passport scheme that encouraged motorists to not only drive the road but have fun while doing so. When a motorist had their passport stamped at five of the seven towns located on the road, they would receive a certificate signed by the state governor that signified the successful passage of the road. I obtained a stamped passport at the KOA campground and decided to participate. I departed for Reno at 7a.m. and headed for Eueka, the second town on the list to get the passport stamped. The passport lists the appropriate agency to visit for a stamp. In Eueka it was the post office. Next stop was Austin, then Fallon, and finally Dayton. In each town the participating agency was easy to find and eager to help. This was a lot of fun on an otherwise boring, desolate ride. I arrived in Virginia City in mid afternoon. Virginia City is an old mining town with numerous shops and restaurants on the main street. I stayed about three hours exploring the town. Reno was a short twenty minute downhill ride from Virginia City. I checked into the Circus Circus Casino and settled in for my three night stay. The total miles for the day was 362 miles. It was nice to sleep in a bed. There were shuttles available at the casino to transport people to the Reno Stead Airport, the site of the air races. The cost was reasonable enough, but I decided to ride the bike instead. That turned out to be a good decision. I left the casino at 0630 and arrived by 0700. I was able to park within a block of the entrance. I purchased a pit pass which allowed me to visit the hangars and outdoor parking areas of the race planes. If you haven't been there before, I highly recommend it. As they say, it is the fastest motor sport in the world - You won't be disappointed. I stayed until 6p.m. taking pictures and talking with the pilots and pit crews. And of course, there were many, many vendors selling hats, food, clothing, aviation art, and even airplanes. On this particular day, I got to witness the closest unlimited race in the 51 year history of the races. Two modified P-51s were within three feet at the finish line. Exciting stuff! This was the big day. The final races for each of the race categories were flown. During the day there were numerous aerobatic demonstrations, team aerobatic demonstrations, military demonstrations, etc. There was always something to watch from about 8a.m. to about 4p.m. I took a lot of videos and pictures the entire day. And of course I bought my share of goodies to bring home. I got back to the hotel at 6p.m. I checked the weather for my return trip, again all segments of the trip forecasted good weather. There was a hurricane near Baja California that was expected to cause problems in California and Arizona in two days time. It wasn't expected to affect me. I loaded the GPS with coordinates and readied my stuff. I also had to figure out how to load all the stuff I bought at the races. The destination was Kingman, Arizona. I departed the casino at 6a.m. and headed east on Interstate 80 to Hwy 50 Alt. I rode to Fallon and picked up Hwy 95 toward Las Vegas. The ride was easy with little wind. Temperatures steadily rose as the morning progressed reaching 100 by the time I reached Hawthorne, Nevada. At one point on this segment a sign indicated the next gas station was 100 miles distant. With more than a half tank remaining I pressed on toward Beatty, Nevada. I gassed up in Beatty and chatted with a group of Germans traveling around on rented Harley's - They were thoroughly enjoying themselves. It was 105 degrees in Las Vegas. I crossed the Hoover Dam bridge into Arizona. It was 108 degrees on the Arizona side of the border. The average temperature was 102 degrees on the way to Kingman, but Kingman was a cool 97 degrees upon my arrival. 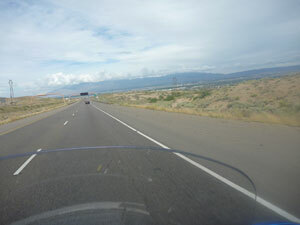 I exited Interstate 40 onto Andy Devine Blvd (Route 66) and the KOA was located on route 66. There is a really nice Route 66 museum in downtown Kingman. I noticed the high temperatures didn't affect the bike at all, the temp gauge didn't move all day. The total miles for the day was 580 miles. Fuel mileage continued to be excellent, getting 44mpg at 75 mph. your way and did whatever it took to get what you wanted. I have always been proud of you and of your accomplishments throughout your life. You followed in my foot steps in many areas through your youth, but developed your own personality and character. You never gave in or compromised your life in any way. There are many qualities about you that I envy and admire. I believe you to be honest, fair, charming, truthful and faithful. I know you are a hard worker, good parent, understanding friend and a loving sibling. There is no one more trust worthy, independent or focused on the things in life than you. However, you have made a few mistakes in your life, as we all have. Life is not easy, it isn't supposed to be. We are all practicing screw ups. We strive for perfection and wealth. People want all things at all times and they want it NOW. Creatures like us never stop and look over the situation, take inventory or acknowledge the accomplishments they have earned. As senior citizens and parents, we tend to view each and every day as a win. Sometimes just getting up and living through the day is a big win. friends. A healthy body and knowledge is always a "W" in anyone's book. I was not a perfect father to you, nor was my father to me. I learned late in life that being a parent takes a great deal of patience, understanding, money, faith, compromise and good drugs. The responsibility of parenting is the single most intense and stressful duty a person faces in their life. Perhaps we should not have children until we reach 40 years of age. All the books, instructions, videos and work shops on the procedures needed for parenting never covers everything. Every person has different methods and tactics used to raise a child. Parenting is a real challenge to an individual's sanity and serenity. When Ed Price emailed me and asked if I would write an article for the E Newsletter, I was so honored that he would ask me to do this. Of course, I told Ed it would be my pleasure. As a lot of you know, my name is Dan Scott. I grew up in Southeast Oklahoma doing what most boys do, riding my bicycle and playing sports mainly baseball. I remember my first motorcycle very well, it was a Suzuki 125. Boy was I ever in heaven, or so I thought! My parents owned a country store and a used car lot. Dad traded for a 1100 Gold Wing - I knew better than to ask if I could ride it. I came home one afternoon from school and went looking for my dad and to my surprise, he was cleaning the bike. Dad asked me if I thought I could ride that "motorcycle"! Let's just say I was hooked on Gold Wings from that day forward. After 30 years with the Department of Agriculture, I decided it was time to get back to what I really enjoyed, riding motorcycles. I bought a 2008 Cabernet Red Gold Wing 1800. I still ride her today with just over 92,000 miles on her, so I guess one could say I do enjoy riding. In the summer of 2009, I had some friends tell me about "Wing Ding". What in the world is that I asked? The lady began to tell me it was in Tulsa this year and I should go being as I owned a new Gold Wing and see what it was all about. I'll never forget all the chrome, lights and people. It was amazing to say the least. I wanted to know more about all of this. Bill Gray called and invited me to attend a meeting at Chapter E in Tulsa. At the time, I owned a hay baling business and was very busy as you can imagine as it was August in Oklahoma. I think it was September when I again received a call from Mr. Bill inviting me to their meeting. I made sure I was there this time. From that day on, I knew I wanted to be a part of this organization. Bill, being the Chapter Director, very soon asked me to be the first Membership Enhancement Coordinator in the state. So, after talking to him about what to expect, I agreed to take the position and make the best of it. I have always been one that whatever it is I'm involved with, I give it my all. Sometimes that's not always a good thing! I recruited several new Members that very first year as Chapter E's MEC. I made phone calls to Member's whose names where on the ARL under the expiring and even the expired list. I must admit I was very skeptical at times but through being consistent, I helped Chapter E grow to one of the largest Chapter's in Oklahoma. They were even named Chapter of the Year! >Yes, I certainly agree with the presenting of the feedback on the use of car tires on a Gold Wing. There has been too much being said negatively about this subject by those who have no experience with them. I have been using car tires on the rear of all (4) four of my motorcycles for four years now with near 100,000 miles experience. Wyndham Hotels - (up to 20% discount at eleven different Wyndham chains including Days Inn, Ramada, Super 8 and more) GWRRA Members save up to 20% on the best available rates at all Wyndham Hotels worldwide, including Ramada, Wingate, Hawthorne Suites, Days Inn and many more. Click HERE to reserve your room today, and don't forget to write down your GWRRA promotion code for when you're on the road and need a hotel! To ensure you receive the discount, please call in advance or reserve online. Use Corporate Code 1000008705 by calling 1-877-670-7088, or book online today! Show Your GWRRA Pride! 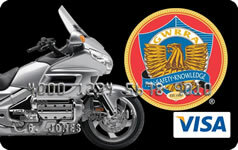 - No Annual Fee GWRRA� Visa� Credit Card Program, with Rewards Program, low introductory APR on Purchases and no balance transfer fees for 6 months. Click here to earn bonus points for FREE airline tickets, merchandise, cash-back and more at participating merchants. Enhanced Visa� Platinum benefits, including 24/7 Emergency Customer Service and 100% Fraud Protection, Auto Rental and Travel Accident Insurance and much more. Competitive interest rates, plus 3 card designs or upload your own picture! CardPartner, under the ownership of United Missouri Bank, offers a co-branded credit card program for GWRRA. Note: Google Chrome is not a supported browser for this company's website. 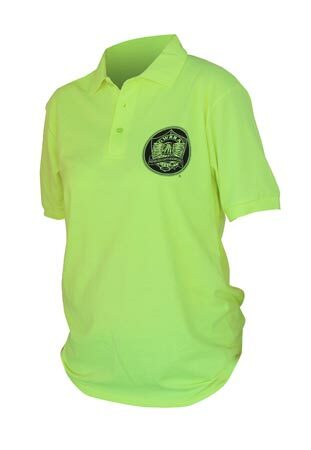 Short Sleeve poly/cotton polo with 4" Griffin logo on front and 10" Griffin logo on back. Available in Hi-Vis Green, Safety Orange, Lt. Blue and now Black with white. Available sizes are Medium Thru 3xl. December Wingin' It special item--sale price $18.39!